For what he says is his final film, acclaimed Hungarian director Bela Tarr has crafted a masterpiece of misery. 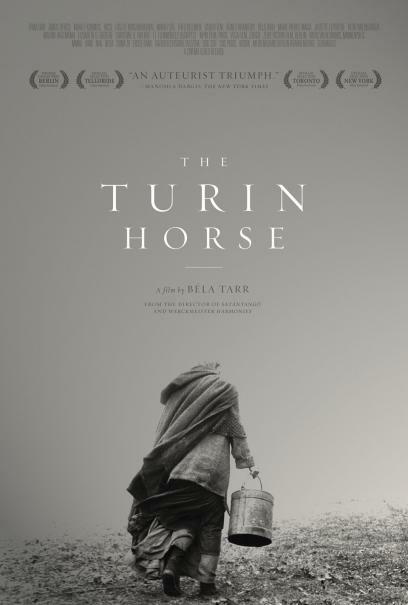 Once again co-written by frequent Tarr collaborator László Krasznahorkai and co directed by Ágnes Hranitzky, THE TURIN HORSE is two and a half hours of unrelenting darkness and despair illustrating a pessimistic view of the world through the harsh and monotonous lives of an old man (János Derzsi) and his daughter (Erika Bók ) trying to eke out a subsistence living on a small farm. Their sole specimen of livestock is a horse every bit as bedraggled looking as they are which, after being whipped by the old man in town, refuses to work or even eat anymore. The basic premise at first reminded me of Kaneto Shindô's THE NAKED ISLAND, an exquisite Japanese film from 1960 I first saw last year (also courtesy of the Cleveland Cinematheque). Both films show families struggling to survive in difficult conditions, but the family in ISLAND, despite their hardships, was imbued with some sense of hopefulness and humanity. Shindo even allows them some small moments of happiness. In THE TURIN HORSE, there are no such moments of respite, and the characters have been so beaten down by life that they barely hold on to their humanity. They simply exist. The genesis of this film is a story about Friedrich Nietzshe: supposedly the mental breakdown suffered by the infamous philosopher near the end of his life was brought about after witnessing the aforementioned horse whipping. There's no evidence to back this story up, but it makes a good starting point for Tarr's film, which treats it as factual. In this way, Tarr is able to bring in allusions to and elaborations upon Neitzshe's philosophy. But where Neitzshe once famously proclaimed God dead, Tarr says he's not only alive, but actively malevolent and more than happy to assist humanity in its rush to self destruction. While this destructive God is a constant presence in the film, represented by the constant gale blowing outside, THE TURIN HORSE places just as much blame on mankind itself for, as the old man's neighbor explains, destroying all that is good and noble in the world. It's weighty stuff to be sure, and with its stark, haunting black and white cinematography, repetitive nature, lengthy shots, sparse dialogue, and considerable running time (though short for Tarr, who is best know for the almost 7 hour long SATANTANGO), THE TURIN HORSE clearly isn't aiming for a mainstream audience. Even many arthouse aficionados will find this film daunting. By the time it was over I personally felt as beaten down as its protagonists. At the same time, I was also entranced, and as bleak a film as it is, THE TURIN HORSE is so carefully composed and perfectly realized that it's impossible to deny its quality. 4 out of 4 stars.